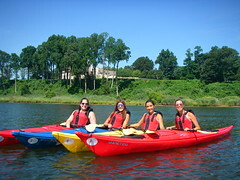 Kayak East offers half day kayak tours at beautiful locations in New Jersey. 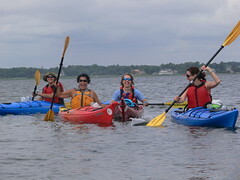 Register for a location below, choose to rent a kayak from Kayak East or bring your own. The beauty of the canal is its pristine stillness in any season. The canal is a wonderful attraction for wildlife enthusiasts and history lovers will appreciate its 19th-century bridges, bridge tender houses, cobblestone spillways and stone-arched culverts. 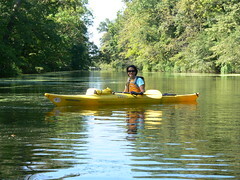 With most of the canal system intact today the D&R Canal is a great place for the beginner or advanced kayaker to enjoy a day of easy, peaceful paddling. 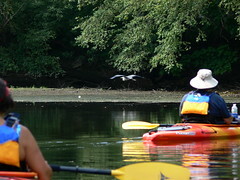 The Delaware River is a favorite spot for many outdoor enthusiasts and for good reason. Its free-flowing beauty, recognized by its listing as a National Wild and Scenic River, is evident all around. With a little current helping us along, we'll guide you through one of the most scenic sections, the Delaware Water Gap. Keep your eyes alert to the riverbanks as we often spot bald eagles during our journey. Turtles, great blue heron, egret, beaver, otter, and more wildlife than you would expect are all here in this quiet sanctuary on the edges of suburbia. Explore nature, lose yourself in the serenity of calm water, and enjoy a day you'll wish would never end. Step up the cool factor on your paddling resume. 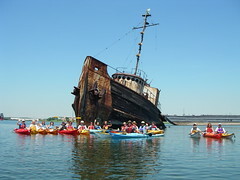 Ferries, liners tugboats, and warships rest in the shallow waters of the Arthur Kill offering kayakers a chance to view the eerie beauty of these ships from the past. 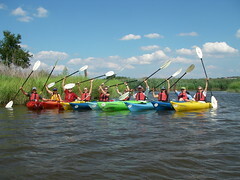 A truly unique paddling opportunity you won't want to miss. Note: The vessels located here are privately owned. Any entry into or onto them is unlawful. Further, they are in a deteriorating condition. As a matter of safety, maintaining a safe and respectable distance is important and will be observed at all times. If you are going to use your own kayak on this tour it must be at least 12 feet long. Amid one of the world's busiest metropolitan areas, the Hackensack River is like few others. Numerous species of birds make their home here or stop over on migration paths. Large concentrations of fish, turtles and crustaceans use it as a spawning ground, and mammals, including raccoon, muskrat and red fox take advantage of the plentiful food available. 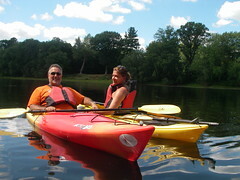 Add in scenic views of the New York City skyline and this river is a great outing for any outdoor enthusiast. Lake Hopatcong is a great place for anyone who enjoys being on the water. 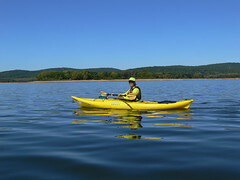 Being New Jersey's largest lake means there are plenty of places for kayakers to paddle and explore. 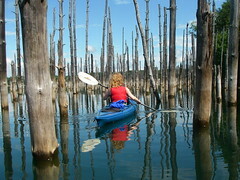 Islands, coves, marshes and canals provide a variety found on few other lakes in the state. Come out for a fun day in a fun place. 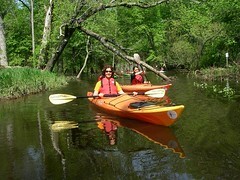 Our paddle will begin on the pristine upper section of this beautiful coastal river. We'll wind our way through a labyrinth of marsh grass and cedar trees as the river widens to reveal picturesque homes on the overlooking bluffs. On our return trip we'll bypass our take out spot for a quick paddle into the narrow forested section upstream revealing a wholly different ecosystem in this diverse estuarine environment. 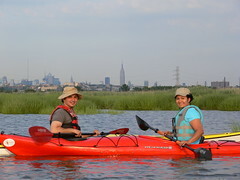 With the NYC skyline as a backdrop you'll be pleasantly surprised to find great paddling in the Meadowlands. The many creeks, sweeping through grassy hills and phragmites, offer an ecological system of tidal waters, where wading birds and other wildlife forage for food in the mud flats at low tide. A great daytime paddle and home to some beautiful sunsets. Witness this unexpected gem right under our noses. For additional dates check out the sunset tours at this location. Surrounding Merrill Creek is over 2000 acres of forests and fields, making this reservoir feel wonderfully isolated. The feeling continues as we paddle through eerily stunning groves of barren trees.White tail deer browsing the forest edge and shoreline often grace us with their presence. Be sure to look for the bald eagles too. For over 20 years this reservoir has been host to a nesting pair of bald eagles and they are frequently seen perched in the trees or flying overhead. 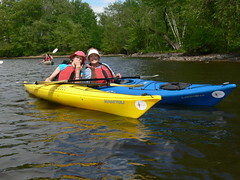 Nestled between two scenic mountain ridges and part of the historic Morris Canal, this section of the Musconetcong River runs slow, flat and beautiful making it a perfect place for a half day of kayaking. This shallow tidal river is best known for the stately mansions that line its shores. Don't overlook the sandy beaches, marsh grass and low tide sand bars though. 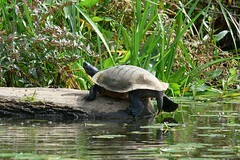 A great river to explore wildlife and the marine environment. We even encountered a pod of dolphins here on a past trip. This is the Passaic River few people know. Bordered on both sides by Great Piece Meadows, this section of the river will take you away from it all. You won't believe the feeling of remoteness as we wind our way deep into nature. A great escape from the summer crowds and especially nice with fall colors providing a beautiful backdrop. Bordering Great Swamp National Wildlife Refuge this section of the Passaic river boasts awesome scenery and lots of wildlife. You'll feel at one with nature as the river's twists and turns carry you past beaver lodges, over their dams and deeper into the refuge's soul. Nestled in northern Passaic County, this easy to reach lake is a perfect combination of open space and lakeside homes. 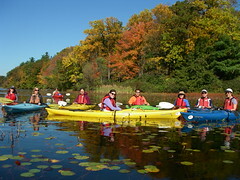 Calm quiet waters ensure your paddle will be relaxing and enjoyable. Flowing through Wayne, Lincoln Park and Pequannock, this often overlooked river is the largest tributary feeding into the more well known Passaic. Once vastly more populated, decades of flooding has forced many to retreat from the banks leaving forested areas to take over where homes once stood. Check out nature as it works to reclaim what it lost. 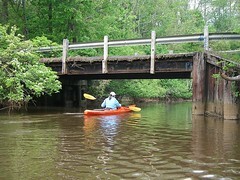 The Raritan is the largest river located entirely within the state of New Jersey and its central location means it is real easy to get to from almost anywhere in the state. Dear to the hearts of Rutgers University students and alumni, the river is glorified in the song "On the Banks of the Old Raritan," sung after commencement ceremonies and sporting events at the college. 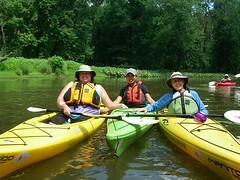 Enjoy an easy paddle in the shadows of the State University of NJ. With more than a dozen creeks feeding into it, this river is one of Sandy Hook Bay's most important estuaries. 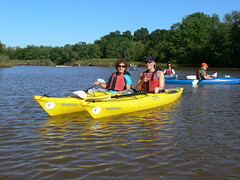 Its marshes and coves provide excellent habitat for wildlife and great exploring for kayakers. Egret, heron, osprey and other birds feed along the shores. Watch sailboats as they compete in a weekly Sunday afternoon regatta. Add in some cool mid-river islands and stately waterfront homes and you'll find plenty to keep your attention on this popular paddle. 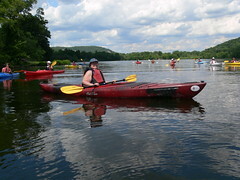 Surrounded by Hunterdon County's beautiful rolling hills, Spruce Run Reservoir is a wonderfully scenic place to paddle. Fifteen miles of shoreline with numerous creeks and coves to explore, abundant wildlife to view and a get away from it all feeling that will surely make your day a great one. 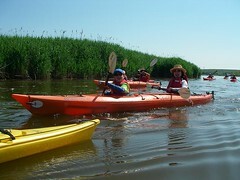 Framed by phragmites and marsh grass, Swimming River is a tidal estuary that flows into the Navesink River on its way toward Sandy Hook bay and the ocean. Winding its way through Red Bank, NJ you'd hardly know it as quiet surroundings insulate us from the busy community. Several nearby areas are also well known as fossil collecting grounds and Mesozoic era sharks' teeth have been found along the shoreline. 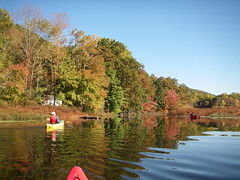 This glacially formed lake in an Atlantic white cedar swamp and mixed oak-hardwood forest boasts some of north Jersey's most scenic fall foliage. It is also home to many animals including deer, beaver, black bear and river otter. One of our most scenic tours, it is also a great place to enjoy a hike on some of the parks numerous trails. Bring your camera!